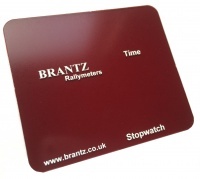 An easy to fit, hinged Sun Screen to fit over the face of the Brantz Rally Timer & Rally Timer PLUS. Designed to prevent any unwanted glare or reflection on the brightest of sunny days, a great flip down cover especially in open top cars. Can also double as a Night Filter if you would like the display lights dimmed.